A new variety with an English Garden Apple Taste! Raised at East Malling Research from a cross between Cox's Orange and Falstaff. Meridian has been exhaustively trialled and tested at tasting panels to find out if 'the public' really do like the flavour, before the variety was commercially launched. The tasting panel were asked to rate each variety trialled, giving points for flavour, texture and appearance. Meridian scored very well and was preferred by most Cox eaters. 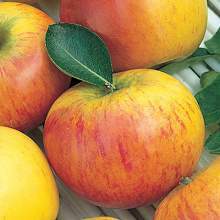 Infact it actually beat Coxs in the trial results as well as popular varieties like Spartan, Egremont Russett and Golden Delicious. Meridian is a fairly large and attractive apple of stripey orange red over a pale green background. It is ready for picking mid September and has already been stored with ease until January and will probably keep longer than this. Importantly stored fruits of Meridian lose very little of their firm crisp texture and also maintain their juicy, slightly acidic flavour too. The tree itself is angular and freely branched and yields have been 30% higher than Queen Cox. Although it is not as disease resistant as some of the other new apple varieties today, it has greater resistance to powdery mildew than Cox and its clones and will be a largely trouble free garden variety. Easily pollinated by a wide range of mid season flowering apples but do not rely on Cox and its varieties. Having passed such specific tasting tests in such emphatic style, you can plant Meridian with every confidence. An excellent long term storing variety with a flavour guaranteed to please!